Mike Myers is the worst kind of comedian. He’s too shameless or clueless to conceal his pathological need to be loved, hugged and cuddled like an adorable little doll. His puppylike insecurity and celebrity vanity, a killer combo that must be torture to live with, are dazzlingly transparent. This makes him do something both understandable and unbecoming: He twinkles. Or he tries to, with heroic strain. You can see Myers push and groan to be accepted, his tiny inner machinery creaking, grinding, belts snapping, smoke poofing hazardously. Inside, he’s dying. Outside — well, he’s doing the same. And he knows he’s dying. So he takes the failed joke a step further to deflect his embarrassment. He does this by adding a weird noise or an odd double-take to the dead air. Rather than dwelling on the flop, we are suddenly diverted by his next non sequitur gesture. This way he takes control of the scene, turning his bombed gag into a fresh meta-gag, one that works as a chummy wink, a nudge of gratitude to the audience for playing along. He’s going for the twinkle. 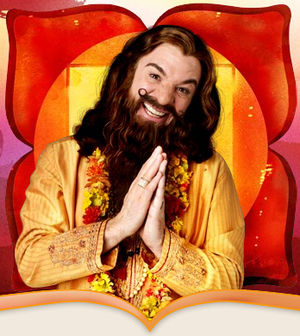 In “The Love Guru,” which Myers co-wrote, co-produced and stars in, the performer twinkles like a big tinsel and glitter papier-mâché star pasted together for a grade-school Christmas pageant. His blissful glow and treacly blandishments are plastic things fashioned from ugly desperation and crude cynicism that bob like so much flotsam on Myers’ oceanic ego. But for the recipe to work it would require Myers and the comedy to be funny, which, almost majestically, they are not. To pinch a word from Pitka’s patois, the movie is transcendentally unhilarious.